MaritimeHerald.com is leading journal about maritime transport, shipyards, ports, maritime piracy and offshore business. The website is Google News indexed, following latest news in the sector. Every day we are trying to inform our readers with the news about shipping, logistics, ships accidents and offshore business. Our website has strong social network presentation, as well as high engagement of the readers with weekly newsletter subscriptions. Our community is consisted of people interested in business, commodities and maritime industry. Our followers are growing rapidly every day, positioning website among the leaders in the business sector. Website is positioning on the top of Google search engine, getting large amount of traffic every day. MaritimeHerald.com is great place for advertising of website in maritime, shipping and business industry. We offer you attractive prices, high authority and top visibility for your banner ads. Your banner ad can blast every day in front of thousands of people, improving popularity and authority of the pointing website. 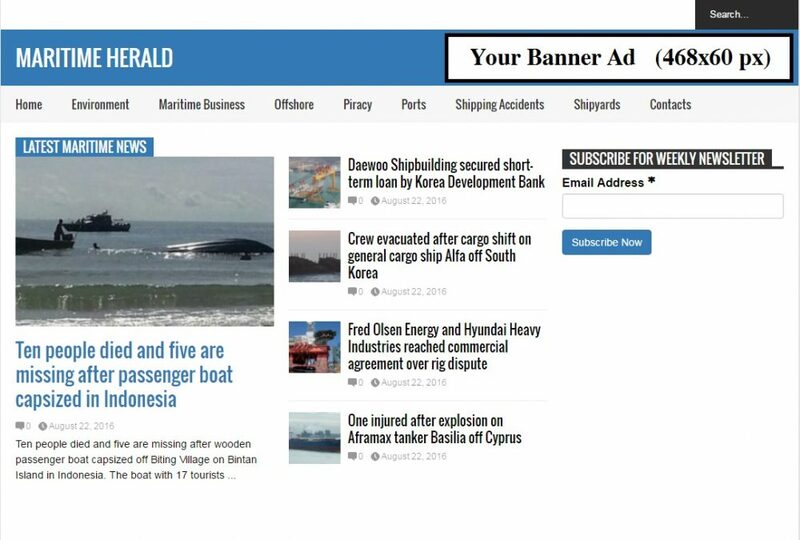 Moreover, advertising on MaritimeHerald.com will improve your ranking position in major search engines and will grow your traffic significantly. Additional Info: Banner will be positioned on the header of the website sitewide, next to the website title. Size of the banner is fixed to 468×60 px and accepted file formats are pictures and gifs only. The banner will be pointing to your URL with direct dofollow link. The price for the banner is 80 USD/month and estimated number of blasts per month are 75,000. The estimated click-through rate (CTR) is 0.5-0.9% with estimates cost-per-click (CPC) of 0.15 USD. Additional Info: Banner will be positioned in the sidebar sitewide, below newsletter subscription form. The size of the banner is 300×300 px and accepted file formats are pictures and gifs only. The banner will be pointing to your destination URL with direct dofollow link. The price for the banner is 75 USD/month and estimated number of blasts per month are 75,000. The estimated click-through rate (CTR) is 0.5-0.9% with estimates cost-per-click (CPC) of 0.14 USD. Additional Info: Banner will be positioned in the homepage only below the Latest Maritime News. The size of the banner is 468×60 px and accepted file formats are pictures and gifs only. The banner will be pointing to your destination URL with direct dofollow link. The price for the banner is 15 USD/month and estimated number of blasts per month are minimum 15,000. The estimated click-through rate (CTR) is 0.3-0.6%, while the estimates cost-per-click (CPC) of 0.20 USD. Additional Info: Banner will be positioned in the single posts (all the maritime news) within content after the end of First paragraph. The size of the banner is 336×280 px and accepted file formats are pictures and gifs only. The banner will be pointing to your destination URL with direct dofollow link. The price for the banner is 35 USD/month and estimated number of blasts per month are minimum 55,000. The estimated click-through rate (CTR) is 0.2-0.4% with estimates cost-per-click (CPC) of 0.20 USD. Note: The estimated views at guaranteed at minimum. If monthly banner fails to reach the value it will be extended until reached the minimum estimated views.